The future of variable star astronomy in the U.S. was based upon a foundation laid in the 19th century by skilled and hard-working amateur astronomers like Seth C. Chandler, Jr., Edwin F. Sawyer, and Paul S. Yendell. Their work was expanded-upon through the efforts of Harvard College Observatory (HCO) Director Edward C. Pickering, who encouraged the increased participation of much needed variable star observers among amateur and professional astronomers. This participation would soon be carried forward to a new level of popular engagement through the timely appearance of the novice, but enthusiastic, amateur astronomer William Tyler Olcott. In 1909, William Tyler Olcott heard Harvard College Observatory Director Edward C. Pickering give a talk about variable stars at a meeting of the American Association for the Advancement of Science. Olcott, a gentleman lawyer, became interested in astronomy in 1905, at about the age of 32, when a friend pointed out some constellations to him. By 1907 he had published A Field Book of the Stars, and in 1909 he published In starland with a 3-Inch Telescope. He made his first variable star observation in February, 1910, and regularly sent his observations to Pickering from then on, joining the other dedicated and enthusiastic individual observers in the service of Pickering. In HCO Circular No. 166 of June 1911, entitled "Cooperation in Observing Variable Stars", Pickering published a list of stars that needed to be observed, including a list of observers who were willing to participate in this project, some of whom are mentioned in the previous article on this web site. In 1931, AAVSO Recorder Leon Campbell recalled Pickering's 1911 Circular in a treatise he called "Looking Backwards, or AAVSO in Retrospect." Campbell declared that "right here, one might say, was conceived the embryo variable star association, which a year later took actual form as the 'A.A.V.S.O. '"But in fact the observers that Pickering listed in Circular 166 were already contributors to Pickering's Corps of Observers and many were later never associated with the AAVSO." Actually, of the 10 individuals listed by name in Pickering's list (not counting Olcott and Campbell), five became Charter Members of the AAVSO in 1917, but only three of them continued to submit observations for more than 10 years after 1911: S. C. Hunter, M. W. Jacobs, and Anne S. Young. Hunter and Jacobs have over 2,900 observations each on record at AAVSO (over an observing lifetime of 23 and 26 years, respectively), and Anne Young submitted over 6,500 observations over a 33 year period. All three were AAVSO Charter Members, and Hunter was also a Life Member. Anne Young was also one of the first AAVSO Council members named in 1917. ...it is a fact that only by the observation of variable stars can the amateur turn his modest equipment to practical use, and further to any great extent the pursuit of knowledge in its application to the noblest of the sciences. But the real significance of Olcott's article is that, for the first time, a novice American amateur astronomer was addressing other novice amateur astronomers on the subject of variable stars in a general circulation popular journal. Olcott's piece was not only an appeal for observations and an explanation of variables, not only a methodology carefully explained and laid out: it was an invitation presented in a warm and friendly tone, with a number of simplified finder charts (provided by Pickering) and light curves, intended to be understood by novice amateur astronomers like himself who could be found amongst the public at large, anywhere in the United States. The final stage of this embryonic development of the AAVSO came in the August, 1911, issue of Popular Astronomy in the form of a notice titled "What an Amateur Can Do." Here, the editor, H. C. Wilson asks: "Can we not have in America an association of observers with a 'Variable Star Section', a 'Jupiter Section', etc.?". William Tyler Olcott answered this notice with one of his own--in the November 1911 issue--announcing the formation of the AAVSO and offering to correspond with anyone who is interested in organizing to observe variable stars. By the end of 1911, "Tyler" Olcott was corresponding with other amateur astronomers, sending them instructions and charts, helping them get started, collecting their observations, submitting them to Pickering at HCO, and preparing them for publication in Popular Astronomy. The first published observations of the AAVSO appeared in the December 1911 issue of Popular Astronomy. It contained 208 observations contributed by: Professor Anne Young of Mt. Holyoke College, Mass. ; Helen Swartz of Norwalk, Connecticut; Stephen Hunter of New Rochelle, New York; M. W. Jacobs of Harrisburg, Pennsylvania; H. W. Vrooman of Kokomo, Indiana; F. E. Hathorn of Des Moines, Iowa; and Olcott himself. By the end of the first year the AAVSO published over 6,000 observations of variable stars in Popular Astronomy. On April 8, 1914, Olcott arranged an informal dinner meeting in New York City to get acquainted with some of the variable star observers with whom he was corresponding. The six who attended--and who are counted among the founding members of the AAVSO--are: Lamont Barbour, Allan Burbeck, Stephen Hunter, Charles Y. McAteer, Edmund Mills, and Edmund Putnam. The first AAVSO meeting to be held in the Boston-Cambridge area was held in November 1915 at the Copley Square Hotel in Boston. The group attending the Harvard-Yale football game included Allan Burbeck, David Pickering, Forest H. Spinney, Charles Y. McAteer, George F. Nolty, Rev. Tilton C.H. Bouton, James L. Stewart, and William Tyler Olcott. The following day the group visited HCO at E. C. Pickering's invitation, accompanied and hosted by Pickering, Solon I. Bailey, and Leon Campbell. The group then adjourned to dinner at the Copley Square Hotel, with Pickering and Campbell as its guests, to discuss AAVSO matters. 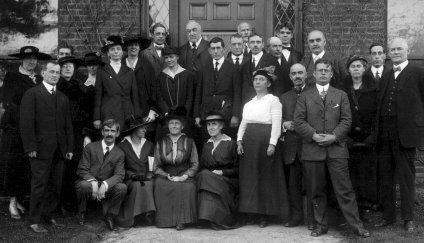 Formal Organization Meeting of The American Association of Variable Star Observers, Cambridge, Massachusettes, November 10, 1917. At the November, 1917 meeting of the AAVSO, the membership decided to organize formally. In October, 1918, the American Association of Variable Star Observers was incorporated under the laws of the Commonwealth of Massachusetts. Harvard College Observatory allotted room for AAVSO Headquarters, and the AAVSO continued to grow.